At Evertrain it's our vision to create a home for people over 50 to feel welcome, get high level fitness coaching and reach their goals in both the short and longterm. 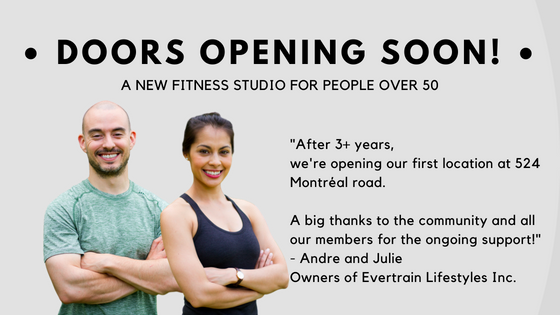 We will be working on this vision moving forward out of our new home at 524 Montréal Road. Evertrain’s mission is to empower people over 50. We help you achieve your goals, improve your quality of life, and live your dreams through complete nutrition, fitness and lifestyle development. Come and meet the team, have a tour of our new personal training studio, enter a draw for some big prizes and much more! October 1st, from 5-8pm. If you’ve been wanting to come and learn about what Evertrain is all about, now is the time to come and meet us and learn how Evertrain can make a difference in your life. P.S. On October 1st, we will have some big announcements to make. Don’t miss out on this awesome event. We hope to see you there!